At least four people were killed and 15 injured after a freight train and a passenger train collided outside the Russian capital Moscow on Tuesday, officials said. Russia's Interior Ministry said the crash happened when several cars of the freight train derailed and hit the passenger service between Bekasovo and Naro-Fominsk, 30 miles southeast of the city. An English translation of the statement was posted by Reuters, The Associated Press and others. According to Russia's Itar Tass news agency, 13 freight cars derailed and smashed into the passenger train, which was en route from en route to Moscow from the Moldovan capital Chisinau. There was no head-on collision, but three cars with people inside were overturned, the news agency said. The cause of the incident, which happened at 12.30 p.m. local time (4 a.m. ET), was not immediately clear, but the Interior Ministry said emergency workers were still at the scene at least two hours later. 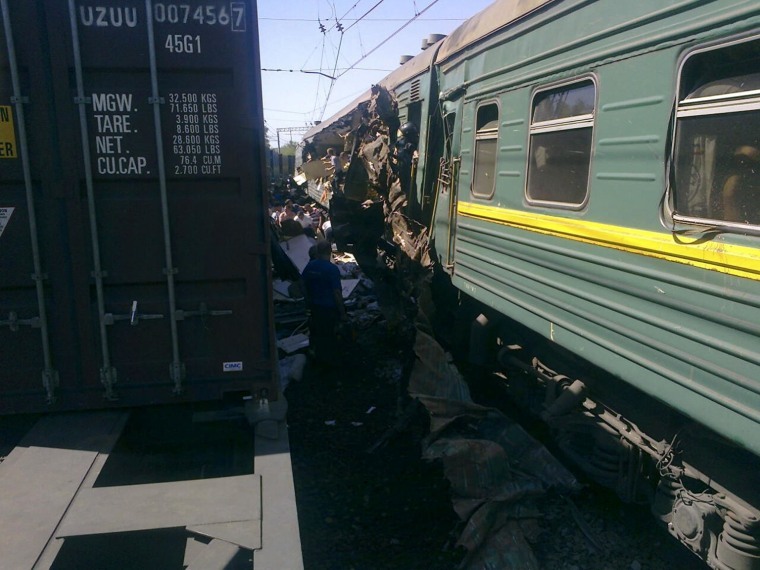 That section of the line, which passes through the Ukrainian capital Kiev, was closed after the crash.